Three years ago I, somewhat surprisingly, fell in love with THE HEALER, Antti Tuomainen’s first novel available to me in translation from the original Finnish. It was surprising because the book is barely crime fiction at all; it’s a kind of dystopian quest but if any element dominates it’s the love story aspect of the novel which normally is about as far from my cup of tea as it’s possible to get. But adore the book I did and so was very pleased to see another novel by Tuomainen make its way to my shores. 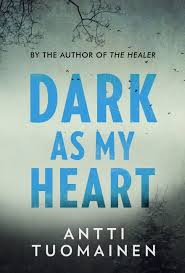 Perhaps it was the weight of expectation but I did not enjoy DARK AS MY HEART as much as the earlier novel and I’ve put off scribbling down my thoughts because I was trying to work out why. Objectively it is not a bad book and shares many of the traits of THE HEALER. It is even, in a way, more solidly in the crime genre and yet, perversely, I think this is part of what didn’t work for me. It is another quest story. In this case we meet Aleksi Kivi as a man in his early 30’s whose mother vanished without trace when he was 13. When police fail to find out what happened to his mother Aleksi takes on the search for answers himself and becomes convinced that a wealthy, well-known business man is responsible for the disappearance. To bring matters to a head Aleksi inveigles himself into the man’s employ with the aim of finally learning his mother’s fate. What does work well is the depiction of Aleksi and his single-minded dedication to learning what happened. Although at times I thought “that’s a ridiculous thing to do” I never failed to believe that his character would do those things. I hope that makes sense. Sometimes when characters in books do silly things I get cross because I have somehow developed the impression that I know the fictional creation wouldn’t do that thing, whereas that never happened here. I can’t say I liked Aleksi but I was captivated by him and did want to see how his quest for answers would be resolved. With the possible exception of the detective who has had the most to do with investigating the disappearance, the supporting cast did not ring as true for me. They seemed…unnatural somehow. I kept thinking they were the kind of characters one might put in a crime novel if one had never read a crime novel. That might be too harsh but whatever the reason I did not feel engaged by these characters – the businessman, his daughter and several staff – who seemed not quite to belong. DARK AS MY HEART is once again short (by modern standards) and beautifully written and translated; Lola Rogers seems keenly attuned to Tuomainen’s almost lyrical style of writing. But I wasn’t sold on the book’s structure. There are flashbacks to key points in the history of the story of Aleksi, his mother and the suspect but these seemed to wrench the flow of the story off its course rather than add the depth and insight I presume was meant. I didn’t by any means hate DARK AS MY HEART and I would eagerly read more from this author. I suppose the problem lies in the fact that I was looking for a repeat of my first experience reading a book from this author. This is completely unfair of me as I rarely adore multiple books from the same author and I should judge each book on its own merits. But I seem not to have managed that in this instance. Consider my wrist slapped. This does sound really interesting, Bernadette, even though perhaps it didn’t live up to expectations. I’ve been wondering what this one was like, actually, as I liked The Healer very much. Hmm…..I may just have to put this on my radar.